What makes a party memorable? Of course it is the people, time spent together, food, drinks, and music, but don’t overlook the fact that a big part enjoying each other’s company depends upon how accommodating the space is. Whether you are designing your room to be continually ready for entertaining or rearranging your home for a special event, here are a few tips to create a welcoming environment for your guests to enjoy spending time together. Set you room up to allow flow and space to connect. When entertaining, remember that people need ample opportunity to wander around and to mix and mingle. This means keeping line of site open, making it easy for people to move from space to space while keeping seating areas available and accessible. Be sure there are spots to sit and chat – encouraging opportunity to have conversation whether getting to know someone new or catching up with an old friend. First, think about the entrance to your living space. When people walk into the room are they visually welcomed by easy, open paths through the room, or is the space closed off and separated (for instance by facing the back of a sofa upon entrance)? For day-to-day use it may make sense to have a sofa positioned with back to entrance … perhaps it provides you with the best uninterrupted view of fireplace or TV screen. But for a party, consider deemphasizing the TV and moving the sofa to the side of the room so that flow in and out is easier. Think about a hotel lobby or ski lodge, these are set up for many guests to have comfortable conversations in small groupings. If you have multiple sofas in your room, consider a back-to-back configuration grouping each with a couple of chairs. If you don’t have space for that, or have only one sofa, you may want to bring in extra seating to create conversational grouping with just chairs. A couple of chairs or ottomans and an end-table make a wonderful niche for people to sit and catch-up. Rooms with a sectional create a different kind of opportunity; if possible try breaking the sectional into individual pieces to create separate conversation areas. Remember the “middle seat” of a sofa or sectional will always be the last to be used. When people have a conversation, they are much more comfortable sitting in unattached neighboring seats, i.e. by the arm of a sofa and the accent chair beside it. This makes it easier for them to face each other while talking. Traditional rules about room focus can be tossed out, the fireplace or TV are not the focal point, the people are. The same goes for windows with a view, go ahead and place a chair or table in front of them. Just be sure to keep the pathways in and out and between rooms open. Don’t be afraid to pull in furniture from other rooms, or pick up a few extra chairs. Things don’t have to match but it is best to have seating the same height so that guests can talk eye-to-eye. Throw pillows are a great addition; they add color and can visually bring disparate furniture pieces together. Plus they offer a welcoming look and can be used by your guests to tailor seating comfort to their needs. As you rearrange and bring in new pieces, remember - don’t over fill the space. Create a many conversation areas as you can, but keep the flow open. Over-filling your room with furniture will inhibit mingling and make people feel trapped in one spot. You’ll want to be sure you have places throughout the room for food and drink service. We’ve all heard that the kitchen can tend to be the big draw as the hang-out spot, but by moving food stations to sideboards, coffee tables, consoles throughout your space, you will encourage people to move about and mingle. 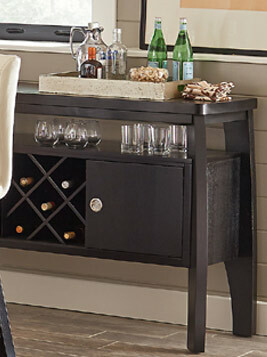 Make-it-yourself drink station set up in the room will be an inviting place for guests to fix their own drinks. This can be as easy as a tray of mixers and a tray of glasses. Don’t forget to add a bucket of ice, and consider a protective cover if you are setting it up on a wood surface. 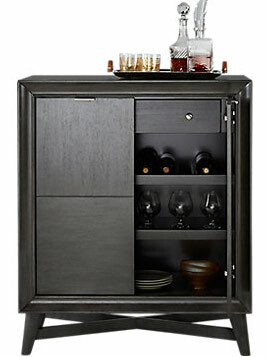 A bar like this would work ideally on a console table, sideboard or server, but could also go on a standing tray table. 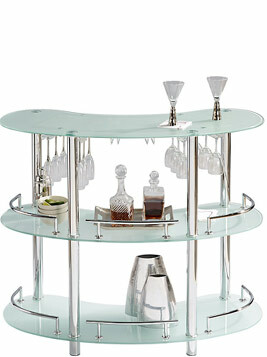 With all of the extra plates and glasses your guests will be juggling, you may need extra tables for your crowd. Again, don’t hesitate to bring tables in from other rooms. A chest, plant stand or bookcase can provide extra surfaces to set things down – look around your house for furnishings the right size and shape, get creative! Utilize layered lighting including subtle ambient lighting as well as area lamps to help create conversation areas. Remember you don’t want the lighting to be too bright and harsh, nor too dim, you want everyone to comfortably see. The right effect is easily created by having lights at different heights -- ceiling, floor and table lamps. You want your guests to be able to see easily but also feel cozy and intimate. If you don’t have quite the right mix in the room already, consider bringing in extra lighting from other rooms or adding candles for variety and ambiance. With a careful eye towards detail and thoughtful furniture arrangement that encourages both movement and conversation, you can create a welcoming environment in your home that will enhance your party and leave your guests with lasting memories.